← Drill of the Month Club? Still looking for Drill of the Month Club Members!!! Email me cbhall@colby.edu if you’re interested – first set of drills goes out October 5th! This week we have a drill called Quick Up Shooting. Emphasis here is on puck retrievals and quick counters. Forwards start on the goal line, and on opposite sides of the circle. D start on the blue line. Coaches with pucks are on the hash marks in opposite zones. On the whistle, everyone activates at once. The forward on the goalline sprints to just inside the offensive blue line. 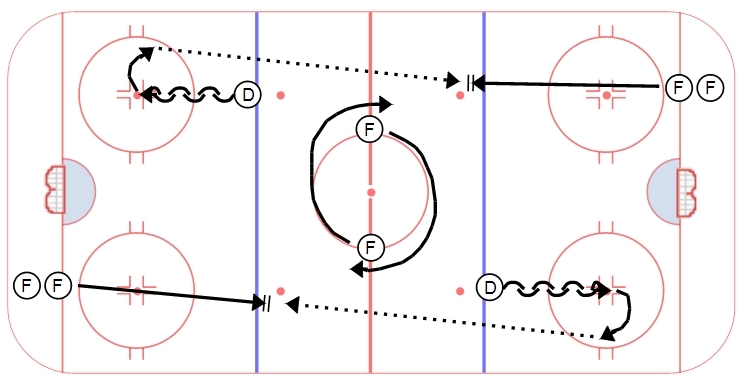 The forward on the circle skates in a support pattern through then neutral zone. The D skates backwards, pivoting to find the puck. The D fires the puck up to the posted forward, who then attacks 2v0 with the forward coming in support – they can chip, cross and drop, drive, etc as they attack the net. D need to focus on powerful backwards C cuts, knowing where their outlets are, and surrounding the puck before firing a good hard pass up ice. The forwards need to read the play, understand their support and make the appropriate play – whether it is an indirect chip, an area pass, etc. Attacking the net, the forwards should be creative and use the ice to their advantage. I like to see a variety of plays, including good net drive, far pad shots, cross and drop, etc.